Just over a month ago, Arizona’s announcement that it will crackdown on teachers whose English is accented or ungrammatical surprised much of the United States. Similarly surprising was Alabama’s gubernatorial candidate Tim James’ trail pitch that “This is Alabama. We speak English. If you want to live here, learn it.” While some wholeheartedly support these pro-English initiatives and others protest the exclusionary nature of them, it turns out that America is not the only country engaged in serious language debates. The New York Times reported yesterday (June 7, 2010) that Estonia now requires teachers to speak Estonian. On one level, this requirement doesn’t seem like much of a shock—of course teachers ought to be able to speak their national tongue—but the issue is really more complex. Estonia’s campaign to emphasize Estonian and marginalize Russian centers around schools. In 2008, 30% of the teachers at Tallinn Pae Gymnasium (where the NYT article interviewed teachers and staff) failed the Estonian language pop quiz (an inspector from the Estonian National Language Inspectorate carried on a conversation with each teacher to see how fluent each was). Another inspection is expected this year. Unlike Arizona, where teachers are fired for their grammatical errors and accents, at this point Estonian teachers are not penalized for their lack of language skills. They are advised to take language classes and, in the future, it is expected that there will be firmer penalties. Thirty percent of teachers at the top school in Tallinn failing the Estonian language test is astounding, but given the political and language struggles of Estonia (especially within the last few decades), it’s easy to see why Estonia’s new policy is considered to be too much. Estonia itself is located in Northern Europe and bordered to the north by the Gulf of Finland, to the west by the Baltic sea, to the south by Latvia, and, most importantly in terms of politics and language, to the east by Russia. A state ruled by many including Denmark, Sweden, and Germany, Estonia was occupied and annexed by the U.S.S.R. during World War II. In 1991, with the fall of Soviet regime, Estonia was once again a free country. During this Soviet occupation and annexation, of course, Russian became the official language of Estonia, replacing the native Estonian language. While the contemporary debate is between Russian and Estonian, it is important to remember that Estonia was an occupied state for much of its existence. Over the centuries, Danish, Swedish, and German have all been official languages, and it wasn’t until the 19th century (during the Estophile Enlightenment Period) that Estonian became less marginalized (only to be replaced by Russian in the 20th century). During Soviet rule, Russian was considered an equal national language to Estonian, but it took precedence in political, economic, and educational affairs. Today, Estonian is the sole state language. The Estonian language tests are not exclusive to teachers (As it is, Estonian law requires that an Estonian language test be passed in order to gain citizenship. 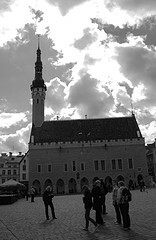 )—other government employees are required to have a competency in Estonian—but teachers play the main role in the drama. For a country that has been defined and redefined since the 13th century by other countries, it’s not surprising that Estonia wants to establish itself as its own political and linguistically defined state. Only time will tell how successful the country will be in imposing its Estonian-only policies, but time is what state employees desperately need in order to gain competency.